The Clochfaen Estate has fishing and rough shooting which guests can enjoy by arrangement. Close at hand we have the stunning River Wye. Watch Red Kites soaring overhead above fields and forests, and discover secret places along every stream and brook. For more detailed fishing information please visit: www.wyeuskfoundation.org. Extending upstream from Llangurig Bridge for approximately 3.7kms is the Upper Clochfaen beat. Much of this stretch is easy wading and very open with little to snag your back cast. Using the same directions as the previous page to Llangurig, turn left just before Llangurig bridge and park in the public car park. Walk to the river from here. The Voucher Box for the Upper Beat is located on the upstream side of the bridge. The Clochfaen fishing has now been divided into two beats. The lower beat comprises some 3kms of double and single bank fishing, and is itself split in to two sections. Parts of the lower section of this beat flow over bedrock so the wading here can be tricky but the pocket water makes for some interesting fishing. From Builth take the A470 north through Rhayader and on to Llangurig. As you enter Llangurig take the left turn next to the Crafts Shop and on to Llangurig Bridge which marks the divide of the two Clochfaen Beats. The Lower Beat Voucher Box is located on the downstream side of the bridge. 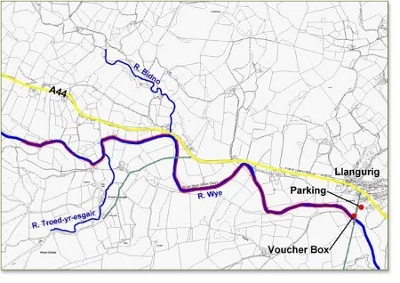 When you have posted your vouchers continue over the bridge following the road south until you come to the first starting point (0.8miles from the bridge), parking anywhere on the verge without blocking any farm access. To reach the downstream section, keep following the road south until you come to Dernol (approx. 3.5 miles from Llangurig Bridge), parking in a small lay-by on your right just before a small cottage.